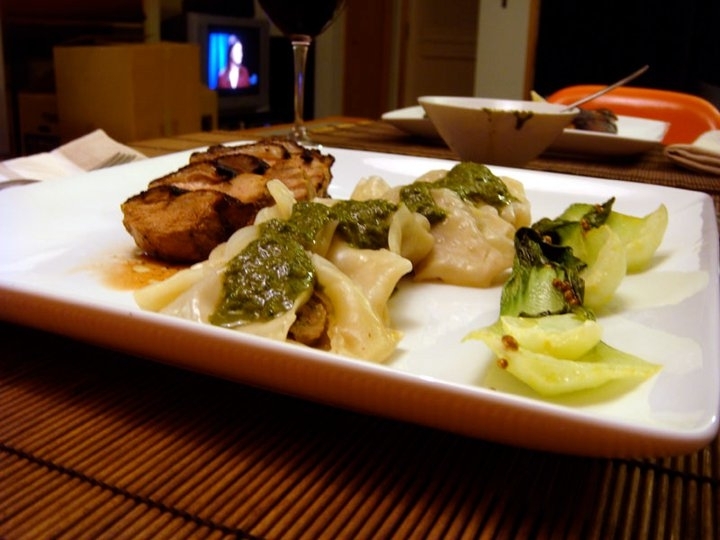 Roasted Duck Breast with Duck Dumplings and Bok Choy – Top Chef Night | Eat.Drink.Life.Love. To say we were surprised by chef Kevin Sbraga’s Top Chef win would be an understatement. Angelo had obviously been the front-runner and Ed had been on fire in the kitchen for many weeks. Angelo’s illness appeared to have taken him down and, as Ed started being a bigger jerk, we stopped cheering for him. While it seemed like Kevin got to the top by having others eliminated for being just slightly worse, he seems like a nice guy that can make decent food so good on him. We *had* to make one of his winning dishes to close out the Top Chef season so we went with the roasted duck breast with duck dumplings and bok choy with coriander sauce. Chad the Bravo intern really outdid himself in the vagueness of this recipe so we gathered up the ingredients and through taste, modifications and guesswork put the dish together. K bought four duck breasts — we planned to marinate and saute two instead of cooking them sous vide (we do not have a sous vide machine despite K’s desire to get one). We took the skin off the other two duck breasts and ground up one and three-quarters of them in the food processor to be used in the dumplings. The other one-quarter and the skin, we simmered with chicken stock with the intention of using it as the “stock” sauce for the dish. With the stock simmering, the duck breast marinating and the meat ground, I pureed cilantro, green onions, ginger and garlic and added just as much soy sauce as needed to make a paste (because the recipe specified HUGE quantities and used the metric system). This was too much soy sauce so it was very soy salty. To counteract this, I added rice wine vinegar until it achieved a much better balance. The sauce made, we added it to the ground duck and began to fill the wonton wrappers to make the dumplings. Then I prepared the bok choy leaves by washing them and sprinkling them with sugar. K sautéed the marinated duck breasts while I put dumplings into the steamer over a pot of boiling water. As they steamed, I toasted the coriander seeds then added the honey and orange juice to the pan. I swapped out one batch of dumplings for another (the dumpling wrappers kept sticking together and falling apart as I tried to get them out of the steamer) then sautéed the bok choy leaves in the coriander sauce. Everything finished at the same time. The dumplings were steamed, the bok choy and duck breasts were sautéed and the stock…well, the stock didn’t fare so well. Because of the fat in the skin, it kept congealing and over-reducing (depending on the temperature of the burner) so we ditched it. If we’d had four hours and duck bones, I’m sure it would have been great. The improvised version was not so good. K was also unhappy that the marinade on the duck breasts appeared to burn as they sautéed.